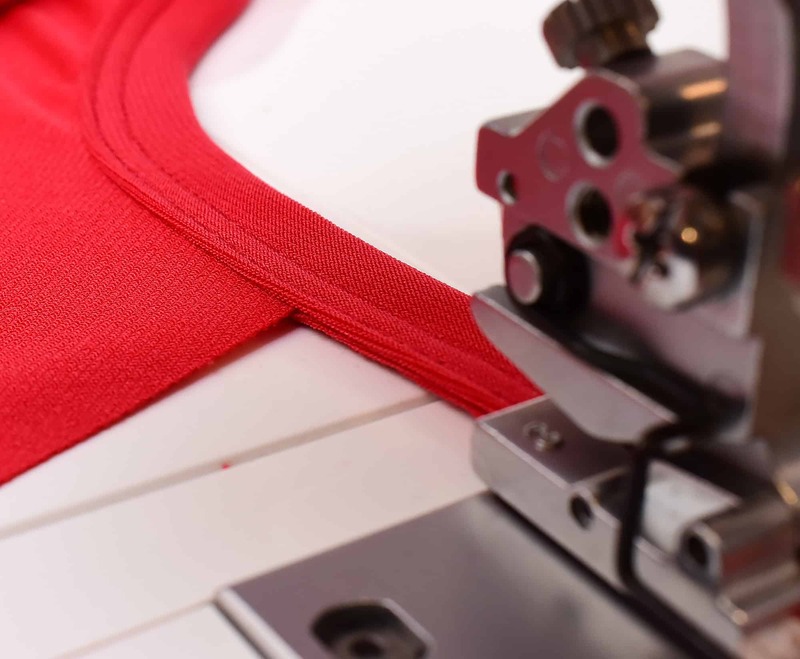 When I bought the Janome Coverpro binder attachment last year for my coverstitch machine, I had high hopes that I would be able to achieve professional looking binding on my knit garments. I even took a class at my dealer’s store to really learn the technique. 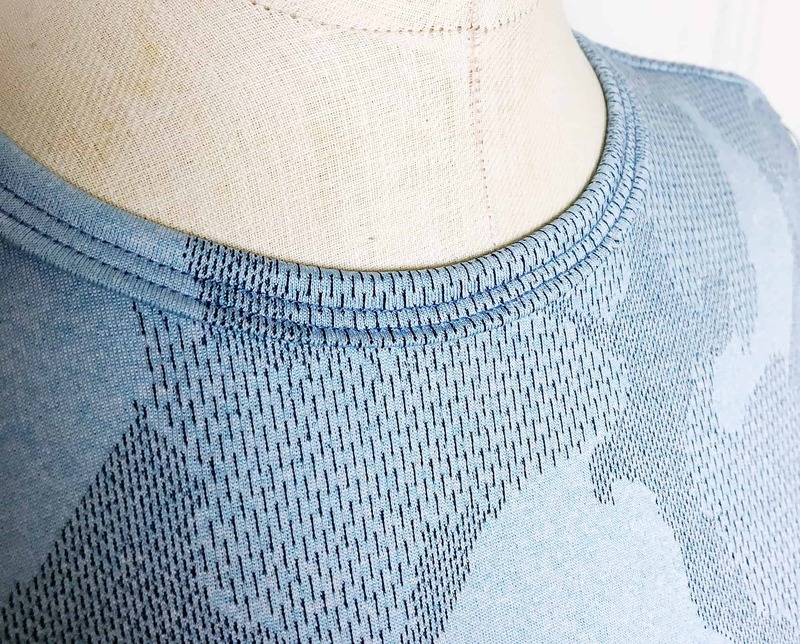 Whereas all those stretchy lycra fabrics that I love to work with was a nightmare to sew. Skipped stitches and uneven feeding was the norm, plus the binding tape kept slipping sideways when sewing, which resulted in very uneven seaming. Not fun at all! 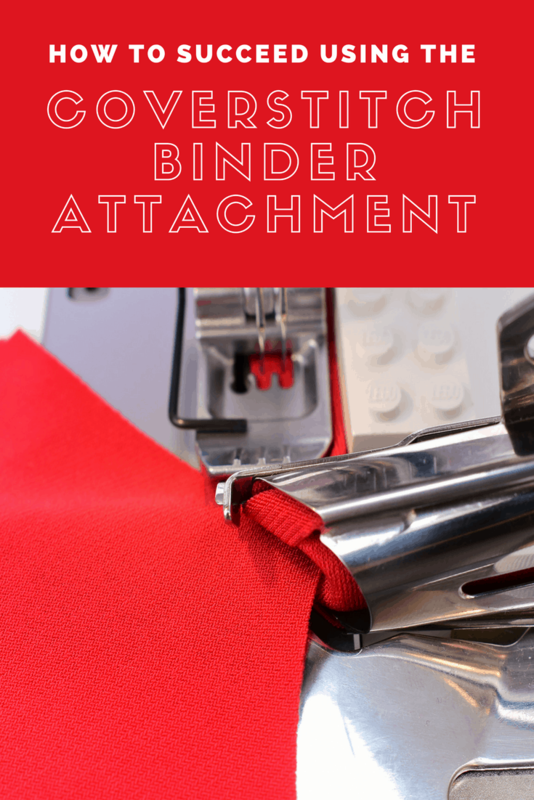 So I decided to do some diligent research, reading blogs and Facebook groups and then just do some extensive testing and practising with the mindset that it is possible to achieve good results with the binder attachment. It took me over eight hours, spread over three days before I was able to sew binding that I felt met my standards. Yes, it was a lot of time devoted to this task, but I did end up with something that looked pretty good, especially considering the fabric I used was a very slippery sports lycra fabric. This is a tip I got from several Swedish sewists. 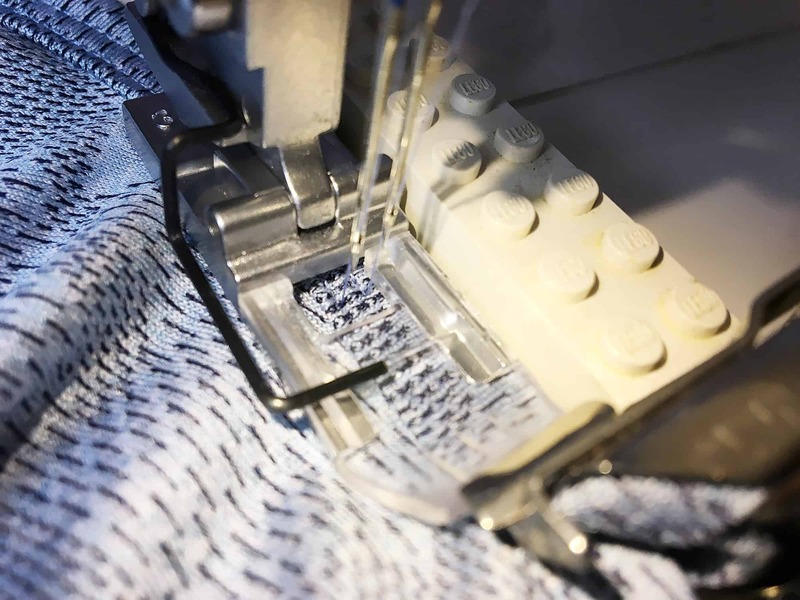 Placing the lego pieces on the right side of the presser foot prevents the binding from slipping. A longer piece is better than the regular size ones. Attach it with blue-tack. Fellow sewist Laura also directed me to something that is called a magnetic seam guide which could work the same way. Another tip I picked up from fellow Swedish sewists. That means 4 on the Janome Coverpro. This setting will help with feeding the tape binding through, plus it won’t look large like it would on regular hemming. I found sewing over bulky binding much was easier when the presser foot pressure was reduced. On the Janome Coverpro, I found 13mm was a great setting. Normally this is counterintuitive as you are supposed to increase the presser foot pressure on thicker layers. Experiment and see what works for you. This might sound odd, but to get to get a balanced seam without wrinkles I had to lower the differential substantially. I had mine down to 0.5, but I think 0,75 would have been optimal on the Janome. Normal setting is around 1.3. 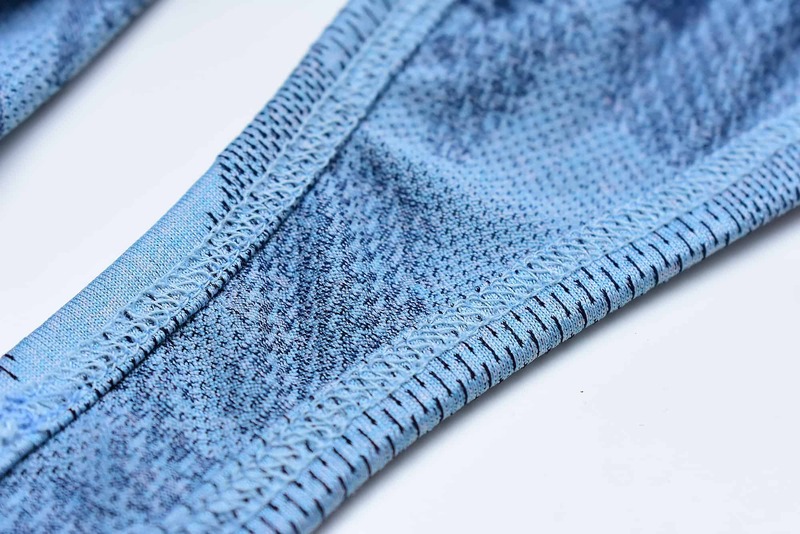 Skipped stitches is another problem when it comes to coverstitching binding. 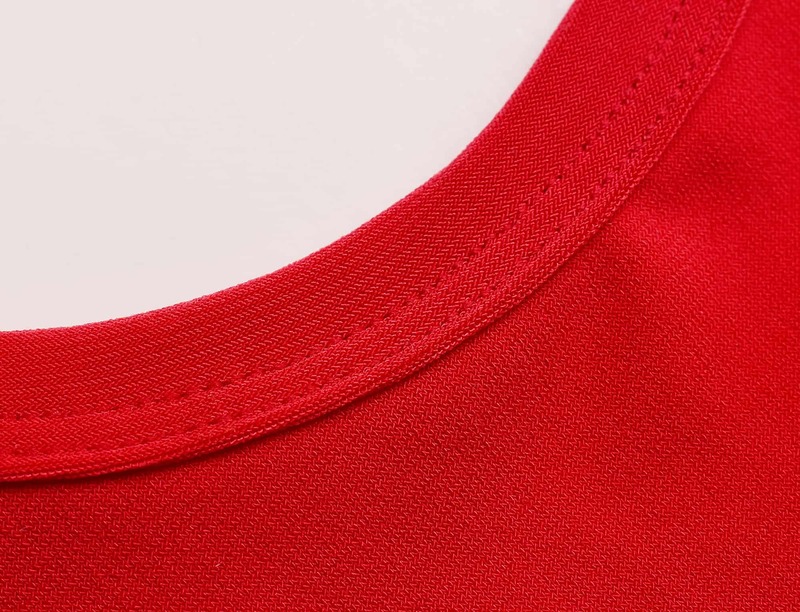 I found that a 90 size coverstitch needle worked better than the 80, as you will sew over many layers. I only use Schmetz ELX 705 overlock needles (Amazon affiliate link); they are the best for coverstitching. 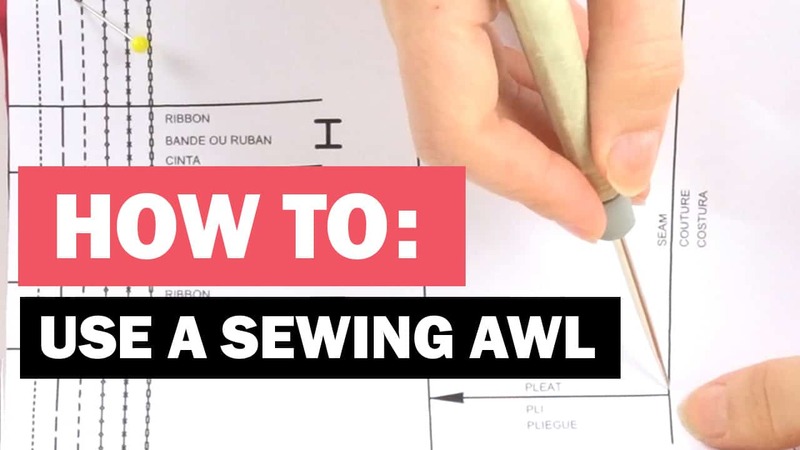 Another tip I picked up from a fellow sewist. 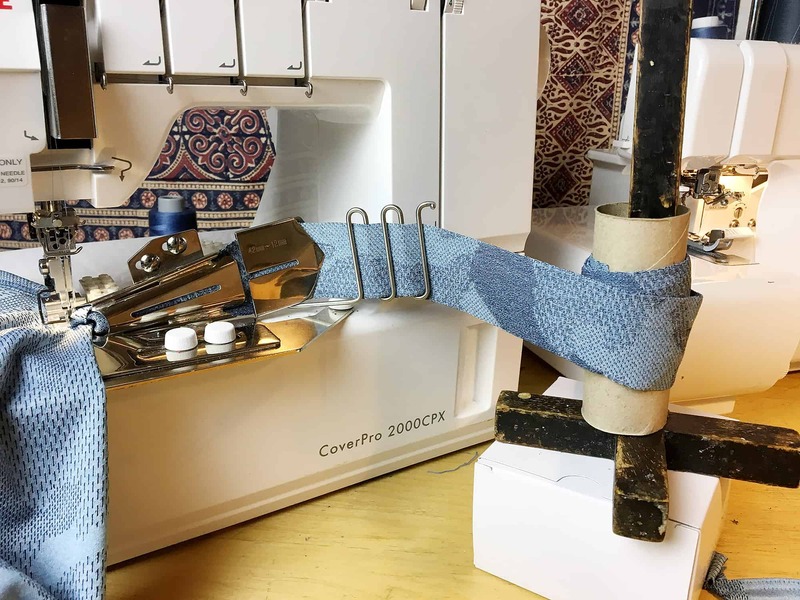 Roll the tape on an empty toilet roll and put it on a paper towel stand, This will help to feed the tape evenly and keep it from collapsing before it is fed into the binder attachment. On the Janome coverstitch binding attachment the plates don’t keep very still, so I ended up taping them in place. Use a narrow tool such as an awl or tweezers to guide the tape back if it starts to slip. 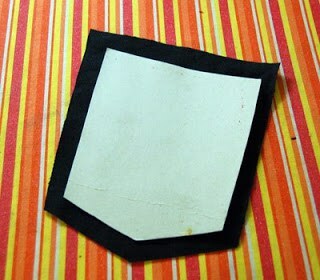 Don’t tug and pull the tape with your hands while sewing, this is a recipe for messed up stitches. This is something I learned in my class and found it to be very true. This could be the number one key factor to success I think. I noticed the same thing when I took the class. After a lot of practising it just went smoother, even though the machine at the store was already set up correctly. 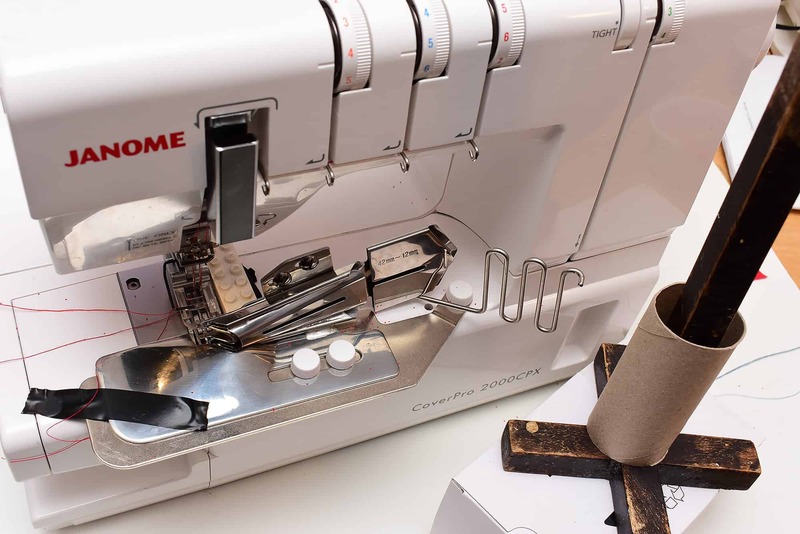 So even if your setup is spot on you might still need to spend a lot of time sewing scraps before moving on to the real thing. Want more suggestions? 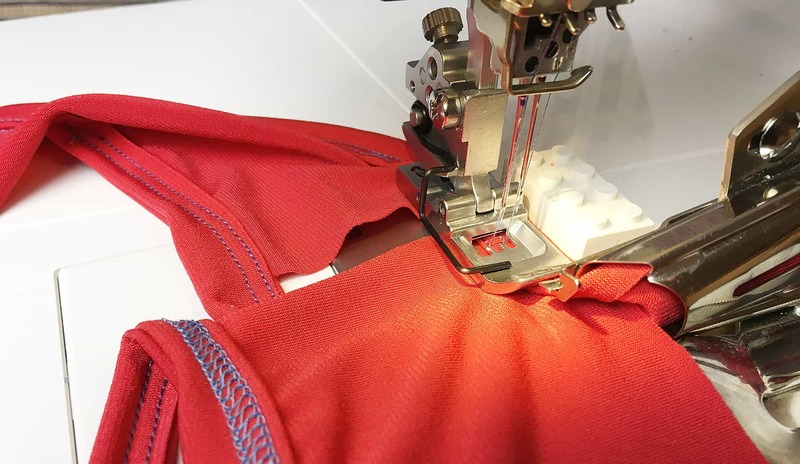 Check out Fehr Trade’s post on tips and tricks for the coverstitch binder attachment. Wow! The blue top looks more than professional. 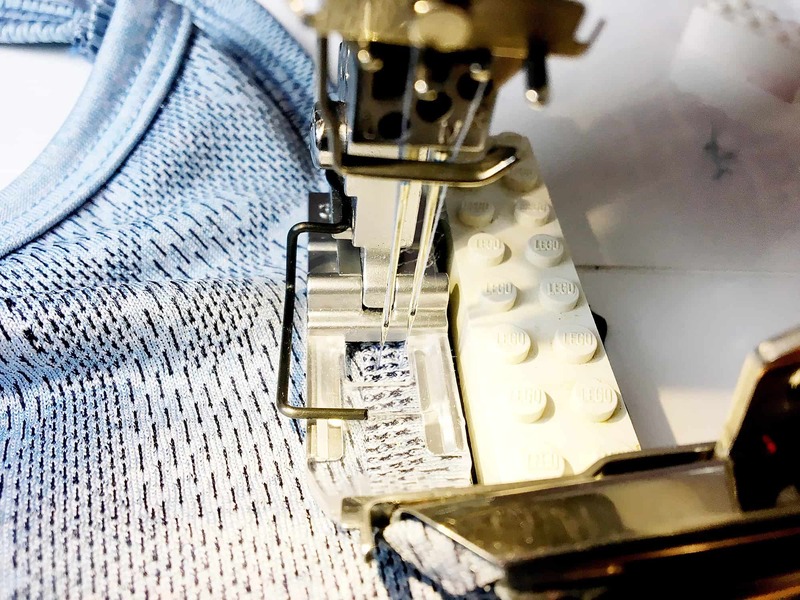 I don’t have a coverstitch machine as I hardly sew with stretch fabrics but I loved reading this post. 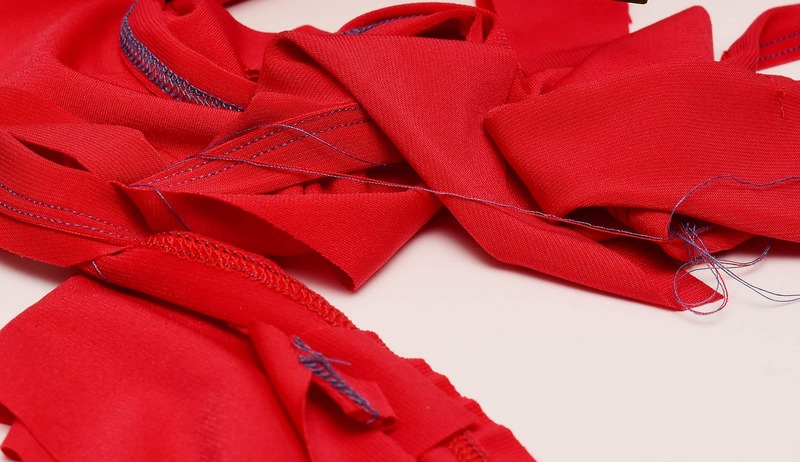 Are they of any use for woven fabrics? Hehe, yes it does require some patience and just like you I already felt confident in my old ways of making a knit binding. But I will say the finish looks so nice once I got it right I felt it was worth it! Thank you for putting the hours in to come up with these tips. I have just asked my children for a lego block (out of the thousand pieces of lego they own)! I’m thinking about getting an extension table and attaching a binder to that. In theory the table supports the weight of the fabric and there is less drag causing skipped stitches. Planning to buy a generic binder off ebay and using blue tack to attach it. This is a cheaper solution than spending Australian$199 for a Janome binder/plus plate. I’m terrifed of spending heaps of money and then it just not working to a standard that I can live with. Your binding looks great and the tips you have provided are wonderful. I find it interesting that you still had to tape down the plate even when it was screwed to the attachment points. I think getting a good generic binder will be a better investment than shelling out $$$ for the brand one. I got my cheaper as part of my coverstitch packet, but I’ve tried a generic that only cost 1/3 of the Janome and it was just as good or better. If I had known this beforehand I would have bought that one instead of the Janome. Those screws just don’t sit tight enough to stabilize the plates. I’ve changed screws and everything but I just can’t get them to keep the plate still. Maybe I’m doing something wrong, but when I took the class the plate wasn’t stable either on that machine. I’ve just bought a generic binder and base plate. I couldn’t get the binder to attach securely to the base plate with the provided screws either. My husband had a look at it and he says it is because the edgings around the holes for the screws are very slightly raised above the plate. Easiest fix is to use one or two washers between the screw and the hole, which has worked for me, but failing that, he said to remove the plate and give a few passes of a metal file over the top of the hole to bring it level or even slightly below the plate. I haven’t needed to do this because the washers worked for me Now I just need to get the settings right. Wow, thanks for all the tips! That lego trick could work on lots of things; my mind is working on the possibilities. Your garments are fabulous and you inspire me to keep trying, so THANK YOU! Happy to hear you found it useful, it was so tricky to learn so I’m happy to share my findings! In reading your post, I am confused as to whether you used the clear view foot or the foot that came with the binder. I have the binder and foot AND the center guide clear foot which is not working for me because the fabric wants to come between the space where the rudder would go. Thinking of investing in yet another expensive attachment, the clear view foot which does not have that gap. You give me hope. I can’t imagine if we didn’t have people like you, I’d give up! Thank you for the information! I have noticed some tape binder attachments with an elastic feed on the top but I can’t seem to find it or any info on this at all, how else can you add elastic in between the binding without having to serge it on. I have a pencil holder next to mine and roll my strips into empty thread spools. I then put a thin rod into my pencil holder, and put the spool on that :). And because I keep them rolled up, I don’t need to worry about them curling up. 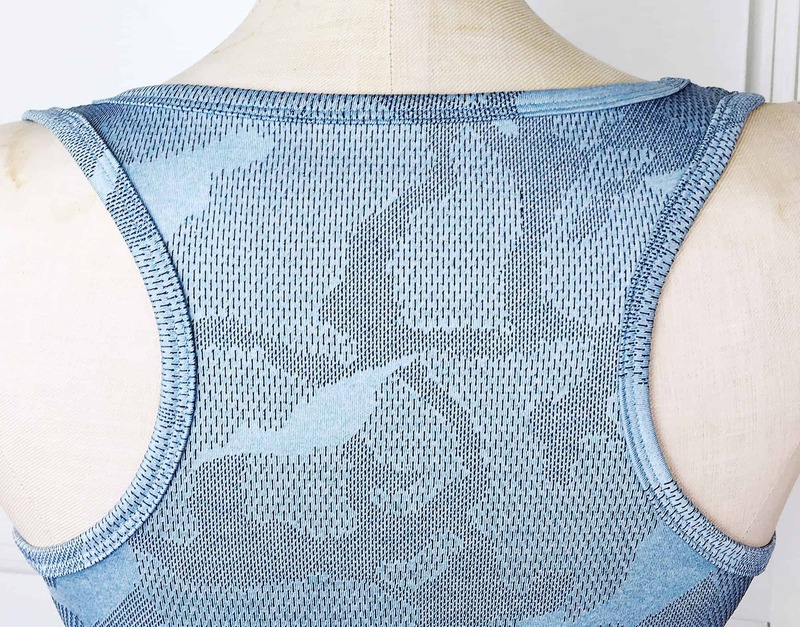 Does this work on very narrow light Modal/Tencel knit? I’m even having issues with tunneling with this fabric unless there’s 4 layers. Recently bought a binder and was not getting good results. Just followed your instructions and used your settings and I got a perfect binding. Thank you, thank you so much. You have saved me hours of trial and error. I really appreciate you taking the time to blog this. Yay, that makes me so happy to hear! As someone who struggled a ton too before I figured all the stuff out, I totally know the frustrations! Hi Johanna, I’ve been practicing with my new binder and have found placing little rubber washers under the screws attaching the binder to the base plate helps to stop the plates from moving, have ordered your book & can’t wait to get it I’ve got lots to learn!